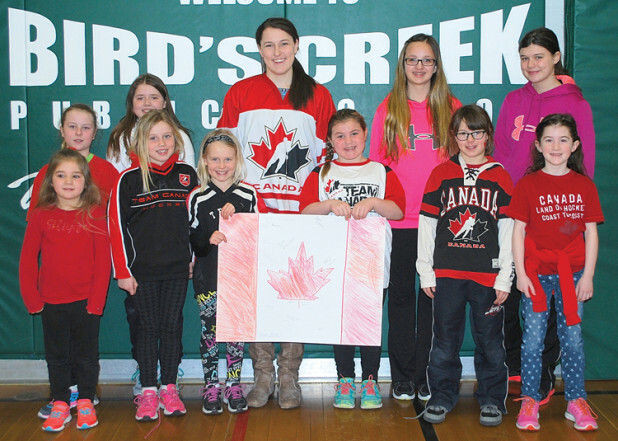 On Thursday, Tori Howran visited the students at Birds Creek Public School where she herself attended as a kid. Watching all the kids file into the gymnasium and the looks on some of their faces as they saw their hometown hockey hero standing there was priceless. As a young girl Tori’s mom enrolled her in figure skating and after her first year she was approached to play boys’ hockey because the numbers were down and they needed more players. Listening to Tori tell her journey from a little Tyke player to playing in multiple towns at higher levels of hockey and ending up on the U18 Team Canada women’s hockey team was both exiting and inspiring. As a mom, I have to admit I teared up as Tori explained her favourite moment during the U18 tournament when she took her first three steps onto the ice surface in front of a home crowd that was filled with family, friends and fans all cheering for the girls in Red and White. It is a moment I could only imagine as a mom of three children reaching some of their highest goals they have set for themselves either in a sporting event or personal event. As Tori told her story you could see the young kids being moved by every word she said whether they were a boy or a girl. Just because we come from a small town doesn’t mean our dreams are not achievable if we work hard enough and want it bad enough. Women’s hockey has come a long way around the world, in Canada and even more so in our small hometown of Bancroft. With three girls’ teams competing in the Lower Lakes Female Hockey League and another one being added next year we are making Bancroft known and feared by the other larger centres. As Tori took on a question and answer period you could tell the kids were listening to her every word as they asked great questions about her whole experience and wanted some special advice. The simple answer she gave was never give up on your dreams and do not let anyone tell you that you cannot be great. As I was leaving the school I had a chance to talk to one of the teachers and I was so caught up in the idea of the great things Tori has done and is doing for girls’ hockey in Bancroft that she reminded it’s not just young girls being inspired, it is children of all ages and not just hockey players, but all organized sports. She has given everyone she has touched the faith to believe in themselves and follow their dreams as far as you can go.